N.C. 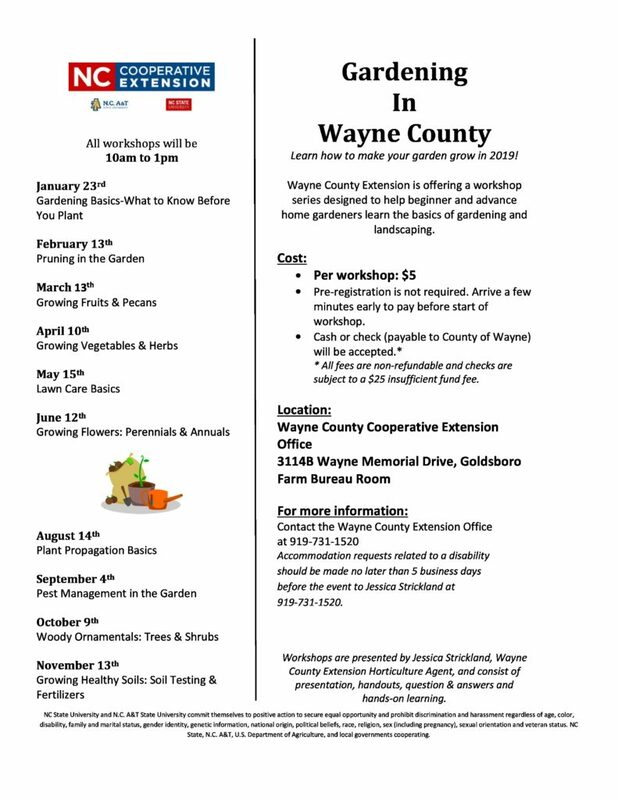 Cooperative Extension of Wayne County is excited to repeat a popular gardening workshop series in 2019 called Gardening in Wayne County. This workshop series is designed to help beginner and advance home gardeners learn the basics of gardening and landscaping. A different gardening topic will be covered each month. You can attend all the workshops or just ones you are most interested in. The workshop provides information to not only answer common garden questions but to also provide recommendations for one’s garden to successfully grow. January 23, 2019, will be the first workshop on Gardening Basics. This workshop will help you learn more about what you need to know before you plant. All workshops will be held from 10 a.m. to 1 p.m.
Workshops will be held at the N.C. Cooperative Extension of Wayne County office at The Maxwell Center at 3114B Wayne Memorial Drive in Goldsboro. The cost per workshop is $5. Pre-registration is not required. Arrive a few minutes early to pay before the start of the workshop. For more information contact the N.C. Cooperative Extension of Wayne County office at 919-731-1520 or email at Jessica.Strickland@waynegov.com.